You need to keep tabs on situations to get the outcome you want. Event and Task activities will get them on your radar, but those activities have many options to set and a growing list will quickly clutter up your calendar. 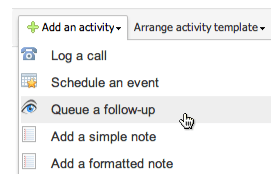 When your inside voice says “hey we need to pay attention to this”, now you can just add a light-weight Follow-up to the related contact, company or project blog to get the details out of your head and into a shared list that’s easy to manage.